We’re in a small white room in private London mental hospital, Nightingale, where the Brainsway device has been in residence for the past few weeks. “I’ve never seen anything like this before,” she tells me. 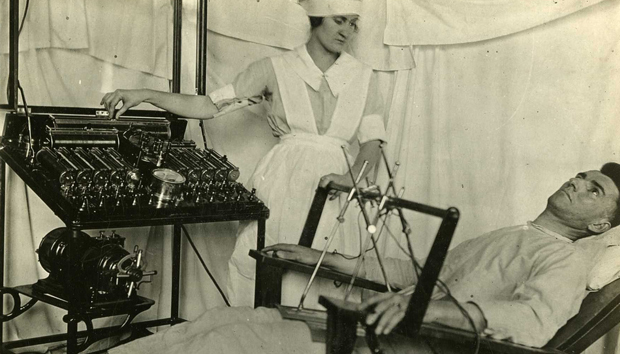 The treatment machine was developed in Israel and is already used widely in the US and Europe on the one-third of depressed patients who are resistant to other forms of therapy. 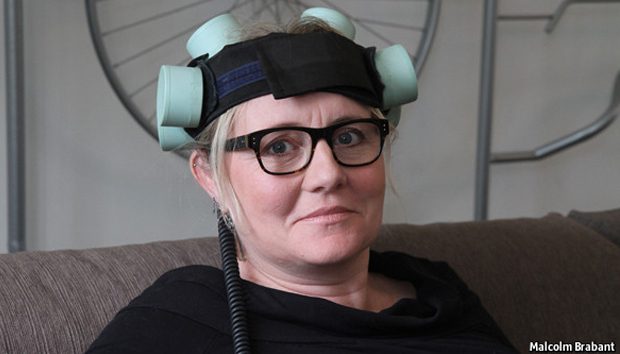 It employs TMS (Transcranial Magnetic Stimulation), which has been widely recognised by the medical community. “The brain is an electrical machine more than anything else. And if you want to treat it in the right way you need to treat it with electricity, with electrical energy, and this is what we’re trying to do,” explains Ronen Segal, Chief Operating Officer at Brainsway. The company believes what it is doing is different from other forms of TMS. This is ‘Deep TMS’ – it penetrates further into the recesses of the brain. “The Brainsway device stimulates superficial and, reportedly, deeper brain regions and the claim is that this leads to greater success,” clarifies Dr Michael Craig, who brought this device to the UK for the first time. “It seems reasonable, but only time will tell whether it is that much more superior. Clearly what needs to happen is a head-to-head trial of Deep TMS and superficial TMS.” This has not happened yet. Things have changed a lot since then. But ECT still involves wires and an anaesthetic. In contrast, the Brainsway treatment is simply conducted in a chair, reports no side effects and patients can resume everyday activities – such as driving – after treatment. The machine does not even look especially daunting. In fact, if anything, it is faintly comical. Galasso takes me though the whole treatment process. First there is a palaver with a blue felt hat and velcroed tape measures. This is important to find the correct spot on the head to administer treatment. With the aid of a nurse Galasso demonstrates how the helmet is tipped over different points on the head to find the right place. After this the treatment takes about 20 minutes and patents are recommended 20 sessions. “The most difficult thing is the noise,” Galasso says “it sounds like a woodpecker”. She leans over and taps my head firmly with a finger to demonstrate how it felt when she tried it. The device was FDA approved for the treatment of depression about a year ago (similar devices for other conditions like PSD, OCD and bipolar are also in trial phase) and studies appear to suggest substantial results. Findings published earlier this year - based on a very small sample of 17 treatment resistant patients - show a 71% effectiveness. It also won an award this October for excellence in technology transfer. One challenge is that “there are lots of different ways of trying to deliver electrical currents to the brain that are being developed,” says Dr Craig. Over in Copenhagen, Professor Steen Dissing [PubMed listing] is in the process of producing his own depression treatment helmet. (“I call it the Captain... it’s a cap”). This was featured in the Economist back in the spring and is based around T-PEMF, a treatment neither Dr Craig nor Ronen Segal had heard of. Likewise Prof Dissing had never heard of Brainsway. He describes it as “far better” than TMS with “much better scores” and cites a study he worked on a few years back which showed TMS in a less positive light. “We are the only ones with this concept [T-PEMF] and pulse - as far as I know,” he tells us. At present Brainsway and Prof Dissing’s Captain appear to be the main pre-packaged depression devices around. This is relevant because in any solution, even clinical ones, the process of how it works in practice is always integral to its take-up. The trouble, as he sees it, is “a lot of people want to come and have it” and it is not necessarily the best treatment for them if they have not already eliminated other options. It is important to remember, Brainsway itself is a public company with a commercial offering. (Brainsway has made headlines in the past for its Stock prices surges). Treatment at the Nightingale costs around £4,000 ($6275) and in the UK is not available through medical insurance let alone on the NHS. 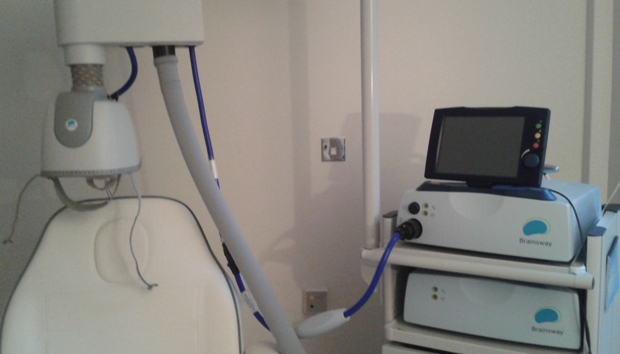 The only other TMS accessible in the UK is via a private practice on Harley Street at around twice the price. “Insurers will cover it [eventually],” says Dr Craig “they do in other parts of the world.” But he firmly believes “somewhere like the Nightingale has got to do what is clinically appropriate rather than taking people’s money and giving them what they’re asking for.” Ultimately he wants treatment to be available in a cost-effective way for ordinary people.